WMAP Five-year Paper Figures, Nolta, et al. The WMAP Five-year temperature (TT) power spectrum. The red curve is the best-fit theory spectrum from the ΛCDM/WMAP chain based on WMAP alone (Dunkley et al. 2008). The uncertainties include both cosmic variance and instrumental noise. 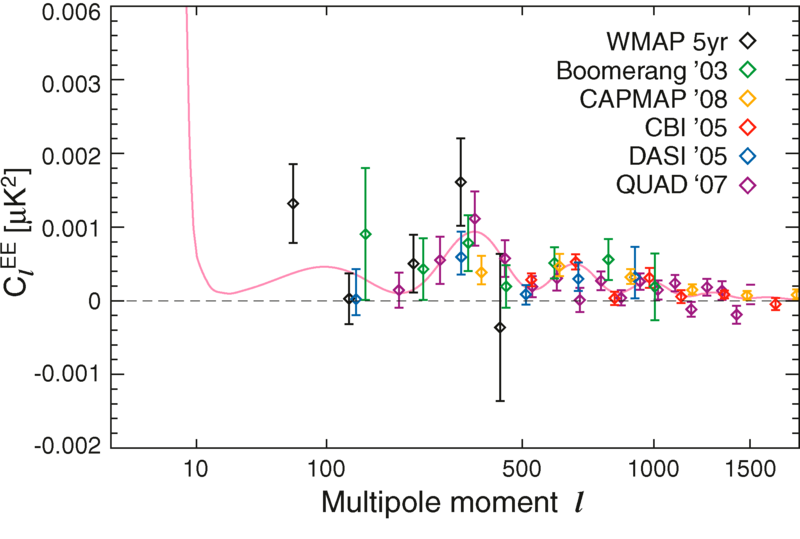 The WMAP Five-year TT power spectrum along with recent results from the ACBAR (Reichardt et al. 2008, purple), Boomerang (Jones et al. 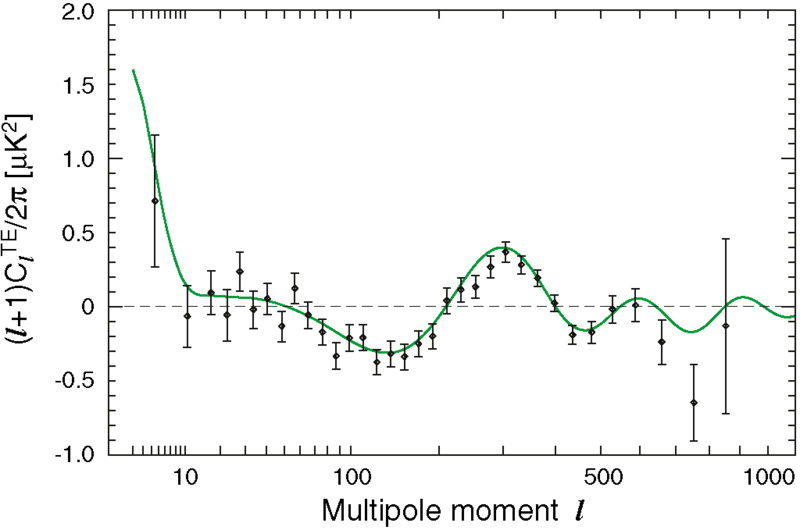 2006, green), and CBI (Readhead et al. 2004, red) experiments. The red curve is the best-fit ΛCDM model to the WMAP data. The unresolved point source contamination Aps, measured in bins of Δl = 100 evaluated at 40.7 GHz (Q-band). The red data points are from the analysis of V and W bands alone and the blue points are from the analysis of Q, V, and W bands. The horizontal dashed green lines, at 0.010 and 0.012, show the 1σ bounds for our adopted value of Aps. 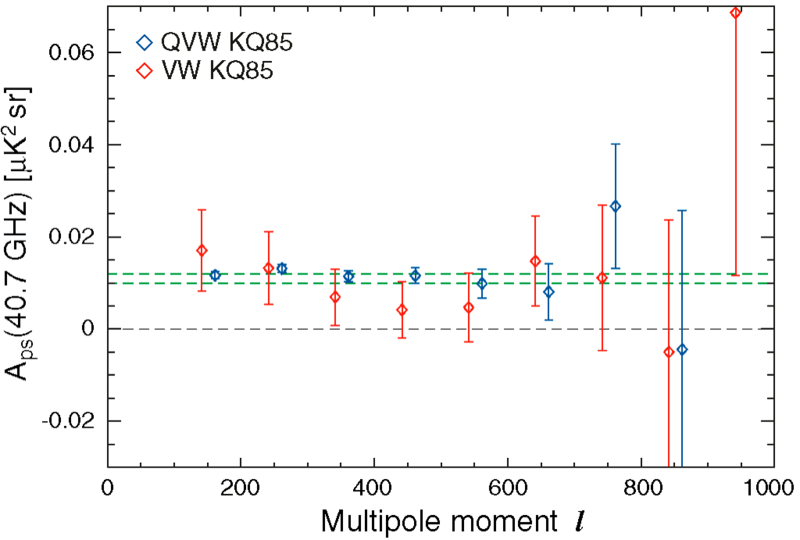 Note that the QVW amplitude is independent of l.
The TT V - W null spectrum. The result is consistent with zero and thus there is no evidence of point source contamination. At l = 500, the TT power spectrum is C1TT ≈ 0.06; thus the contamination is limited to roughly 3% in power. The WMAP Five-year TE power spectrum. The green curve is the best-fit theory spectrum from the ΛCDM/WMAP Markov chain (Dunkley et al. 2008). The clear anticorrelation between the primordial plasma density (corresponding approximately to T) and velocity (corresponding approximately to E) in causally disconnected regions of the sky indicates that the primordial perturbations must have been on a superhorizon scale. 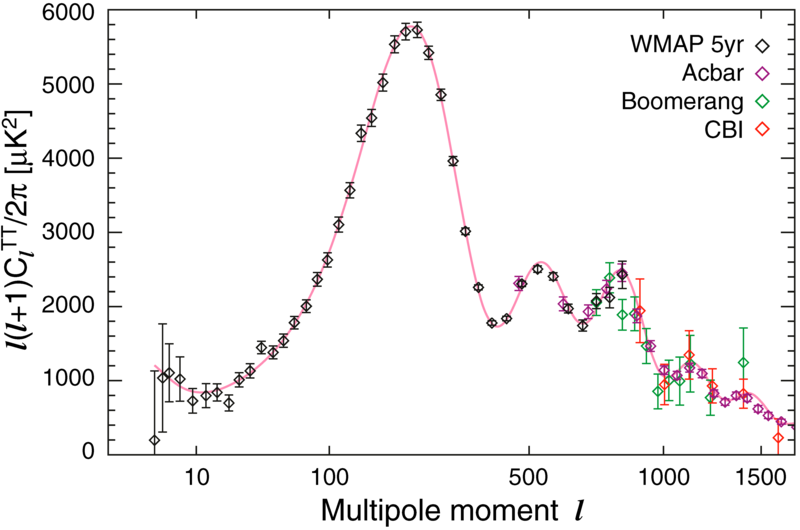 The WMAP Five-year TB power spectrum, showing no evidence of cosmological signal. The null reduced Χ2 for l = 24 - 450 is 0.97. 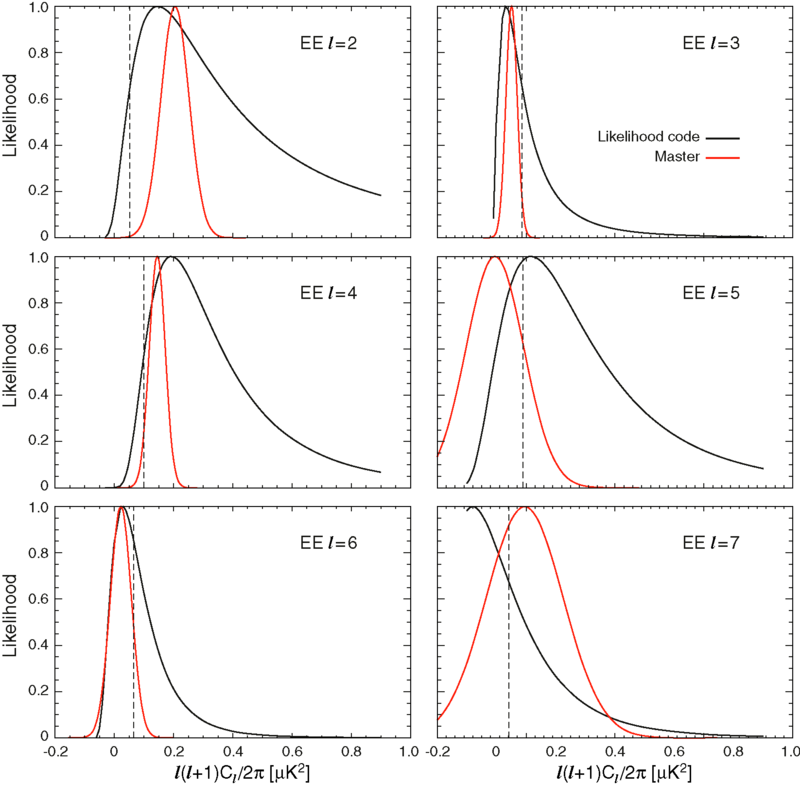 Conditional likelihoods for the l = 2 - 7 EE multipole moments (black curves), computed using the WMAP likelihood code by varying the multipole in question, with all other multipoles fixed to their fiducial values. 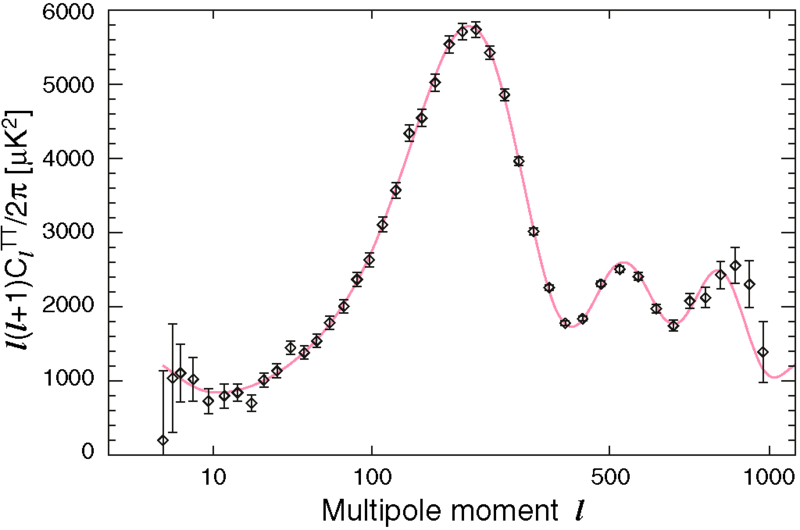 For comparison, naive pseudo-Cl estimates are also shown with Gaussian errors (red curves). The pseudo-Cl errors are noise only, while the conditional distributions include cosmic variance. Conditional likelihoods for the l = 2-7 BB multipole moments (black curves), computed using the WMAP likelihood code by varying the multipole in question, with all other multipoles fixed to their fiducial values. For comparison, naive pseudo-Cl estimates are also shown with Gaussian errors (red curves). The pseudo-Cl errors are noise only, while the conditional distributions include cosmic variance. WMAP 5-year EE power spectrum at low-l. 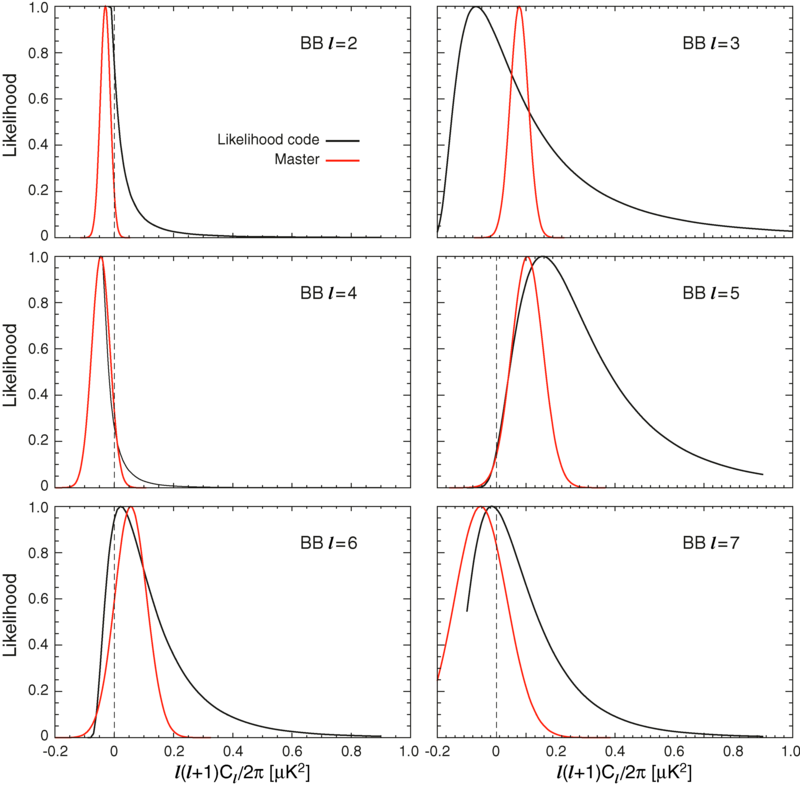 The error bars are the 68% CL of the conditional likelihood of each multipole, with the other multipoles fixed at their fiducial theory values; the diamonds mark the peak of the conditional likelihood distribution. The error bars include noise and cosmic variance; the point at l = 7 is the 95% CL upper limit. The pink curve is the fiducial best-fit ΛCDM model (Dunkley et al. 2008). 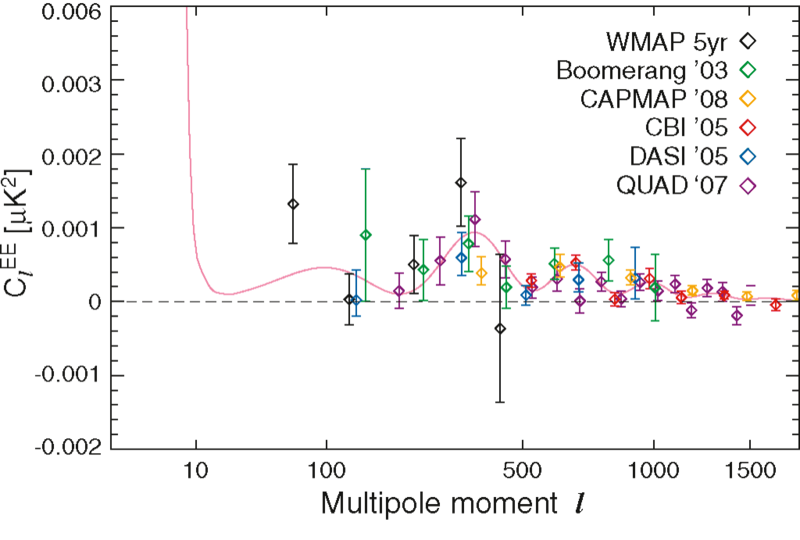 WMAP 5-year EE power spectrum, compared with results from the Boomerang (Montroy et al., 2006, green), CBI (Sievers et al. 2007, red), CAPMAP (Bischoff et al., 2008, orange), QUAD (Ade, et al., 2007, purple), and DASI (Leitch et al., 2005, blue) experiments. The pink curve is the best-fit theory spectrum from the ΛCDM/WMAP Markov chain (Dunkley et al., 2008). 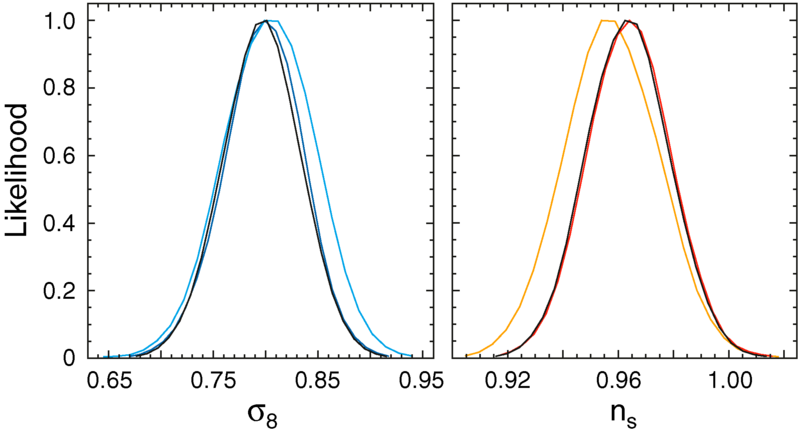 Left: One-dimensional marginalized likelihood distributions of σ8 for various treatments of the source uncertainty in the likelihood code: the standard likelihood function [black], the alternative treatment of the source uncertainty described in equation (A5) [blue], the alternative treatment, but with the unresolved point source error increased by ×5 [cyan]. The agreement between black and blue curves shows that the standard treatment is producing the correct answer. Right: 1D marginalized likelihood distributions of ns for various treatments of the beam uncertainties: the standard likelihood function [black], the alternative treatment of the beam uncertainty described in equation (A5) [red], the alternative treatment, but with the beam error increased by a factor of 20 [orange]. The agreement between the black and red curves shows that the standard treatment is producing the correct answer.